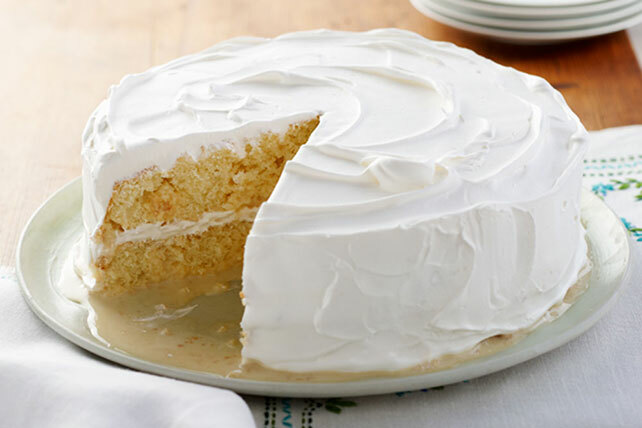 Stir a package of JELL-O Gelatin into a box cake mix for this Layered Lemon Tres Leches Cake. Enjoy this milky lemon tres leches cake this weekend! Prepare cake batter and bake as directed on package for 2 (9-inch) round layers, blending dry gelatin mix into batter before pouring into prepared pans. Cool cakes completely in pans. Pierce cakes with large fork at 1/4-inch intervals. Blend next 3 ingredients in blender until well blended; slowly pour over cakes. Mix 1/2 cup COOL WHIP and lemon juice in medium bowl with whisk until blended; stir in remaining COOL WHIP. Stack cake layers on plate, filling and frosting with COOL WHIP mixture. Assemble cake on a cake stand or platter that has a rim as some of the cake's milk mixture will run out of the cake as it stands. To add milk mixture to cake with less mess, pour milk mixture into clean plastic bottle with narrow squirt tip. Insert tip of bottle into hole in cake before gently squeezing milk mixture into hole. Continue across both cakes.